This foot soldier half armor is accurately designed after historically 15th Century Pikeman soldiers and other similar foot soldiers. 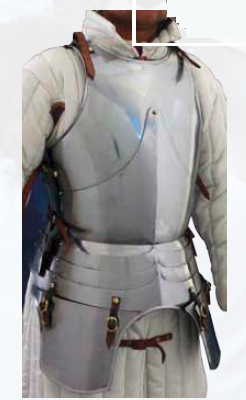 This armor is of highly polished 18 gauge carbon steel. It has thick, tough leather straps to fit the armor together. It will fit a person up to 6'2" and 220 lbs. Chest size up to around 48 inches. The suit consists of a gothic styled breastplate and back plate that are fastened together with leather straps and buckles along the sides and the shoulders, as well as attached an attached series of plates, called a fauld, that wrap around the waist and hips. Attached to the fault are a pair of tasset plates that hang down and provide protection for the upper legs and thighs. 15th Century Pikeman soldiers and other similar foot soldiers. This page was last modified on 12 December 2013, at 18:51.